Can it be done???? No sugar for one whole week? You may say that a week isn’t so long, but for someone like me it may very well feel like an eternity. You see I love sugar. I love all things sweet. I'm not so much a candy fiend as I am a brownie, ice cream, cookies, and yummy desserts fiend, but if I don’t have my favorites around I will gladly eat candy. Now back to the no sugar thing. I feel like my sugar intake has gotten out of control and I don’t want to pass my bad habit onto my baby. So I am going to do a week sugar detox. I am hoping that if I get it out of my system then maybe I wont crave it so much. I will start Monday morning. I am a bit nervous as I have never attempted such a feat before. wish me luck. I'll let you know how it goes. Blaspheme! I'm a sugar-holic too and I prefer cookies and brownies over other sweets but I don't usually turn anything down. Good luck and definitely let us know how it goes. If you survive okay then maybe I'll consider doing something like this. Good Luck!!! Do you have anything that you are going to replace it with. Like some raspberries or something. It's like being Diabetic. Let me know if you need some treat ideas!! Remember when we tried to do that on the mission, ha ha ha? after we "piged-out" on no-bake cookies to the point of making ourselves sick. I think we lasted 3 weeks, thinking we would form a habit of not wanting sugar. But, if I recall, the day we ended the "fast" we went right back to our old ways. When you say "baby" do you mean Olivia, or did I miss something??? Hum. 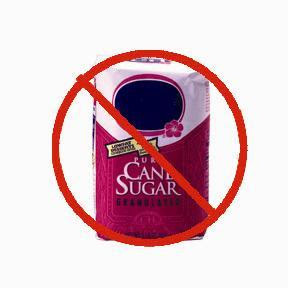 Deb and no sugar-- that's an oxymoron if I've ever heard one! Good luck Deb! I guess if I decided that I would just call it anorexia week. Breakfast of a pop tart and Mt. Dew and that sets the pace for the rest of the day, I would be screwed!